Fri July 19: Weathered Kings is playing at The Drake in Mississauga starting at 9:30pm. I won’t be there (I’m heading up to Kincardine for a family wedding) — HOWEVER, WK alumni Howard Rabkin (bass) and Nick Robitaille (guitar) will be there along with Mike and our new drummer Kelly Micallef to rock the joint. Sat July 20: Blackboard Blues Band makes it’s debut at the Amacon Rotary Ribfest in Mississauga (I’ll be back from Kincardine for this gig!). We close off the night from 9pm-11pm at the fantastic Celebration Square stage; but come early to enjoy all the festivities and the Rotaract Sing Fest that will precede our performance. Thu July 25 – Sat July 27: Blackboard Blues Band returns to the 25th Beaches International Jazz Festival in front of the Firehall on Queen (just east of Woodbine) — 1904 Queen St. E. We play Thu-Sat from 7pm-11pm each evening. A number of my talented friends are also participating in this year’s Streetfest, so come on down and check out all the great music. 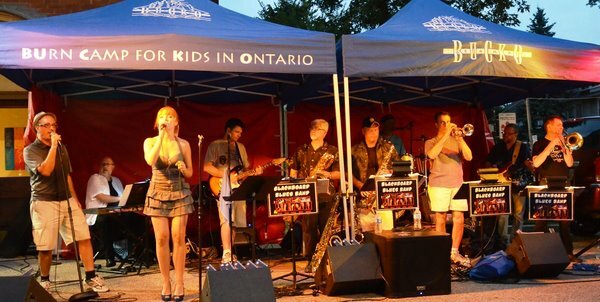 Sun July 28: Blackboard Blues Band is at it again, this time playing at the Richmond Hill Ribfest at Richmond Green Park, 1300 Elgin Mills Rd., E., in (where else?) Richmond Hill, Ontario. Our performance starts at 2pm. Speaking of Blackboard Blues Band, we were on CTV Toronto news last week as part of the coverage of the 25th Beaches Jazz Festival. Check out this report by Andria Case. I hope everyone is coping with the very hot weather and enjoying your summer. As always, thanks to each of you for your support and encouragement. It is greatly valued and appreciated.